We got Dulcimail! Not only that, but two separate messages asking about some of the same things, which I cover in a two-part episode. It doesn't get any more basic than this: stringing up, tuning up and chording up. Starting from strings off through tuning in three different modes and then part two deals with three basic chords and minor music theory. No cat appearances in this one. Sorry. What can you do? They're cats. So, I've been working on this song since June of 2006 and wanted to share my progress with those new to the song and with those of you who took Butch Ross' workshop on this particular tune. Josh Noe, hey nephew - bring on the response video, mang! 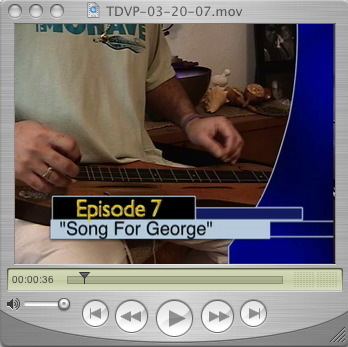 Check it out - a workshopping of "Song For George." TDVP Episode 6 - "Squire Wood's Lament"
Send YOUR questions and topic sugggestions to me at bingfutch@yahoo.com.